Nowadays, giving personalized wedding gifts to new couples has become the most practical way to show how much they care about them. There are some wedding gifts that can be regarded as traditional. These are usually garments and jewelry or even items that were possessed within the family for generations. However, making use of personalized wedding gifts will surely make a great impact on the couple and I am sure they will remember you for the rest of their life. This will be a very interesting project. You can come up with a very interesting concept for a wedding gift. The families, friends, and relatives could write a message or small stories of the bride and the groom. It can be passed from one person to another. And the whole stories can be concerted through a word or phrase. 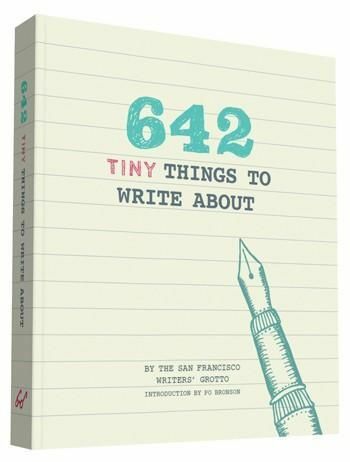 You can collect all these stories and message to create a small book. This book will be cherished by the couples for the rest of their life. It is accomplished together by all the friends and relatives. You can also enrich the layout with their pictures. Small gift packs make special wedding gifts. You could buy them flower vases, flower pots, tableware, table mats, doormats, wall hanging and more. All these gifts can be personalized with their personal touches. 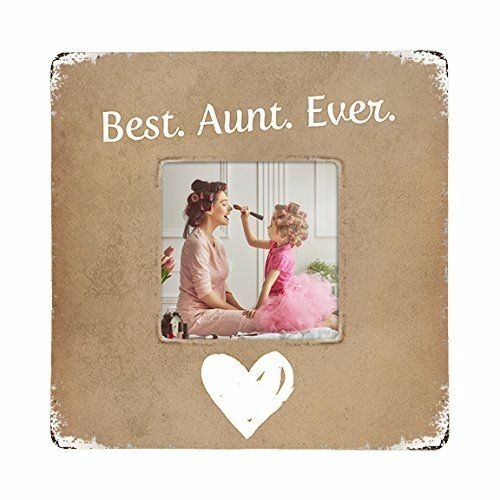 For example, you can buy a personalized doormat personalized with their family name and you can also choose a flower vase printed with their pictures. The meaning of getting the one that is truly special is to have the couple in mind when choosing them. One of the main trends among modern wedding gifts is that these are practical and unique for a newly married couple who are starting a new life. Personalized watch box is one of the main attractions for relatives and friends who wish to gift something special and useful. 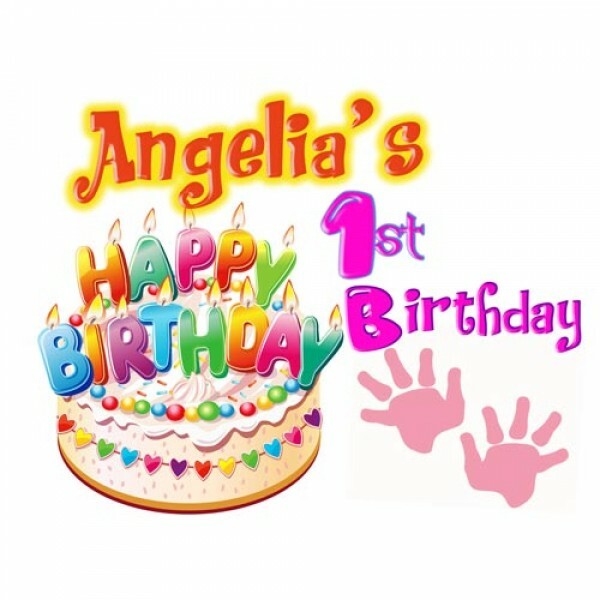 You can personalize the gift online. You have the choice of personalizing the watch box with the names, initials or your short message. How cute and unique would these be for a wedding gift? You could also give them to your bridesmaids and groomsmen with their names or initials. This is the perfect wedding gifts guide for you. We have round up the best wedding gifts for couples. We made a list, check it twice and found the top wedding gifts for every couple on your list. Here are the perfect present for them. What are you going to buy for your mom as Mother’s Day is almost around the corner? Are you wondering how best to show your love to your mom on Mother’s Day? Mothers give the gift of life, they deserve a day to celebrate the special occasion. Here I'd like to introduce the best mother's day gifts in 2018 to you. What better way to show your love and appreciation than with a unique and special mason jar. You can do it by yourself and this project is simple. The most wonderful thing is that you can personalize it with your own favorite photograph. Here I’d like to show you several mason jar ideas. The first idea is mason jar picture frame. Step 1. Placing the sticker on the front of the mason jar. Step 2. Spraying paint on the mason jar in the color of your choosing. Step 3. Once the paint has dried, remove the sticker. Step 4. Then place your photograph in the mason jar. Step 6. Finally, take your mother’s favorite flowers and arrange them in the mason jar. The second idea is memory jar. 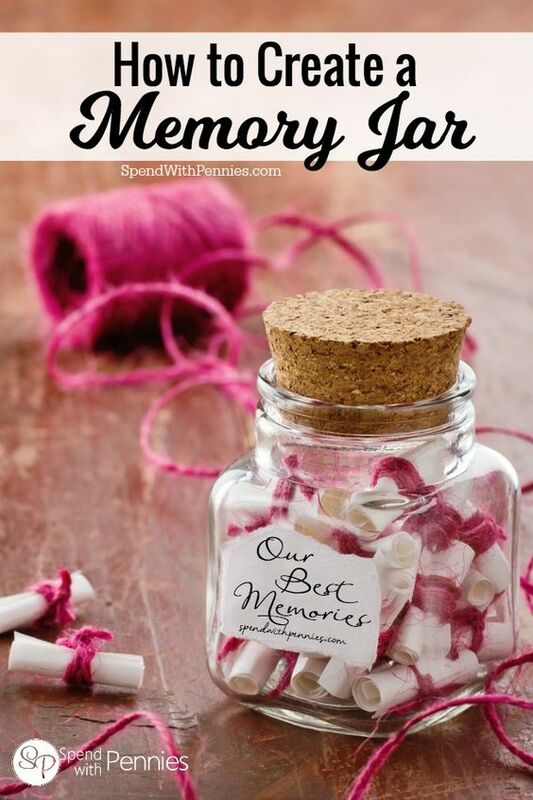 How to make your own memory jar for your mom? Step 1. Find a mason jar and clean it. Step 2. Placing the sticker on the front of the mason jar. Step 3. Write a meaningful message on the sticker. Step 4. Fill out all of your printables with personalized memories. Step 5. Decorate the mason jar with twine, glitter, ribbon, buttons and other things. Step 6. Fill your mason jar with finished printables and gift to your mom. Some big memories are remembered for a long time while those little memories can sometimes be forgotten. So this gift will record all the great joys and memories from the years you have spent together with your mom. The third idea is the gift in the jar. These ideas are a very practical solution to several problems that you face while buying meaningful and perfect Mother’s Day gifts. Personalizedcart provides more detailed information on mother’s day gifts, unique ideas for mother’s day, perfect mother’s day gifts, mother’s day gift baskets and more. Just feel free to browse this website find exactly what you need. Spring is not as far away as it may seem! It’s almost coming! 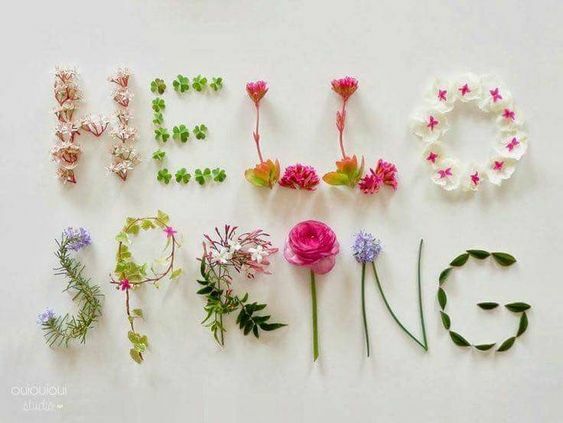 There are so many reasons to welcome spring. The sun is shining bright, the trees and grass are turning green, the air is warming up. There are bright colors of emerging tulips, daffodils, and roses. We can finally say goodbye to the cold and the snow. Spring is coming, and with it comes spring cleaning and renewal. I can smell the spring in the air- so waking, so inspiring! It a great opportunity to open the window and do some spring cleaning and refresh yourself. It’s a time to start waking up and looking for bright updates that will make you even more beautiful. Spring is one of the most beautiful times of the year brings with it hope, renewal, and rebirth. Let some fresh air in and give the bedroom a thorough cleaning. 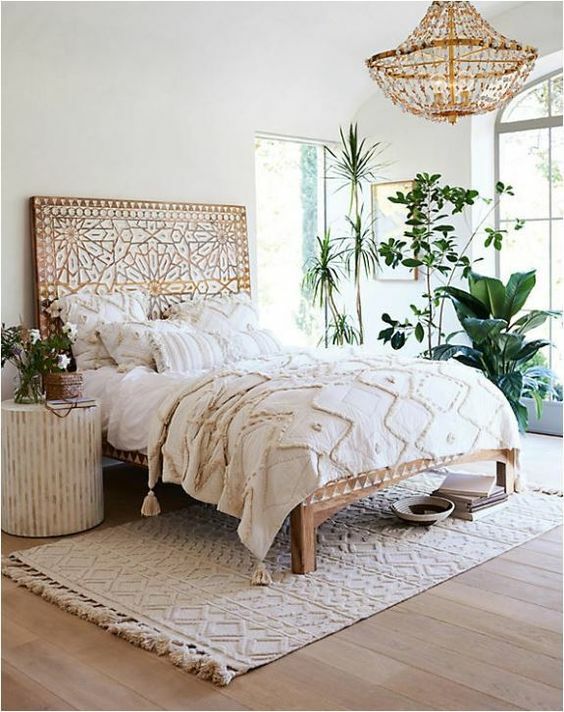 It's time to brighten up your bedroom with a whole new look. It is always said that: "your outer world can reflect your inner one". If your bedroom is always chaotic it could be a sign that your inner life is also in need of some "spring cleaning". Your down comforter, down pillow, and feather bed are in need of cleaning in spring. It is also a good idea to air them out. You can do this on a dry sunny warm day. Your life will look cleaner and lighter at the end of your spring cleaning and has space for the new to land. Spring is a season for new beginnings. It is also a time for gardening and planting. So, choosing a gardening gift for yourself is perfect. You can buy flowers. Flowers can deliver fresh and bright in spring. You can also choose a flower bottle filled with flower seed for planting. You will feel compelled to bring such a spring gift for yourself. You can choose roses, lilies, orchids and more. 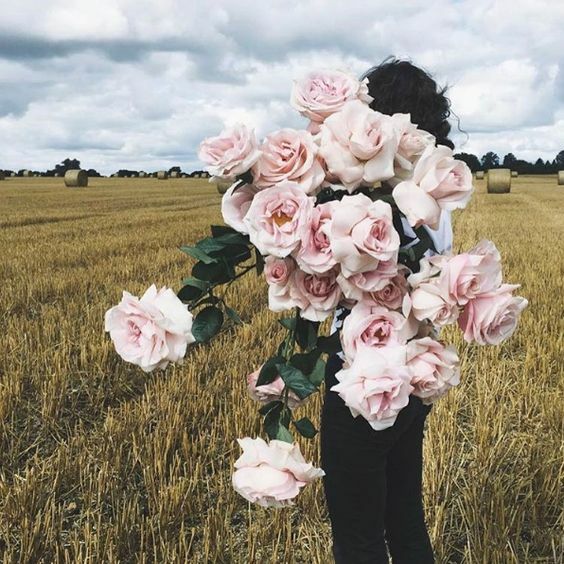 These flowers come in handy for you. They smell nice, they look good and they make us feel happy. Buying flowers for yourself can cheer you up. Flowers can really brighten up a room by adding color and cheer to it. 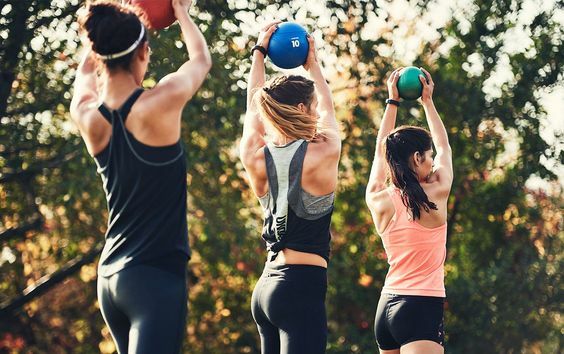 Spring is a season for outdoor exercise. Most of us move less during the cold, dark winter months. Now, spring is coming. You can hear the birds chirping happily. All kinds of flowers bloom and the greens go back again. There is a sense of possibility in the air. It is such a great time to go out and do some exercise. So, get outside and get inspired. It's free and it's available anywhere and anytime. You can step out your front door and do your exercise. Being outside in nature gives you changing scenery that is stimulating mentally, as well as motivating. These are three tips for spring cleaning and renewal. Hopefully, these tips have given you some good ideas for finding more tips to cheer up and refresh in spring. Do you have any other tips to cheer up? Comment below and let us know. The wedding day is one of the most memorable time in one’s life. We want to make sure everything is perfect and we also want everyone to be amazed so we focus on the smallest of details of our wedding. We often give little attention to bridesmaids wedding photos and there are no special photos of your bridesmaids in your album. 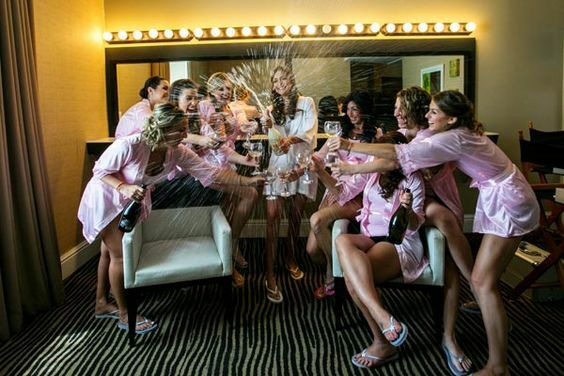 However, your photos and your bridesmaids will absolutely be some of your most treasured from the day. Therefore, You should take advantage of having all your girls around you and create some fun and creative photo opportunities that you’ll cherish forever. 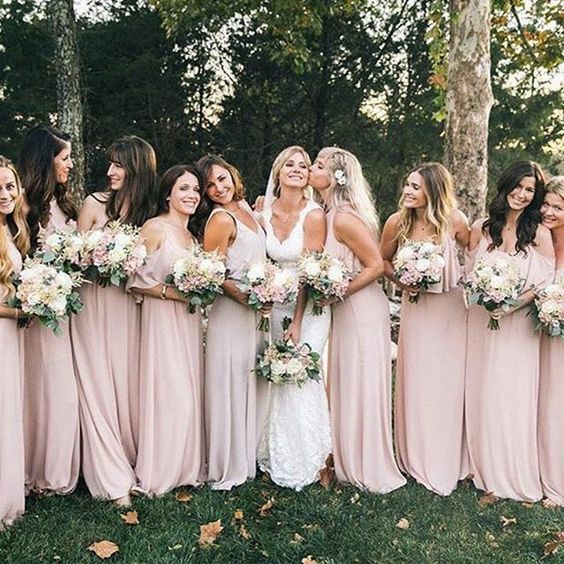 Here, we bring you some wedding photo ideas featuring beautiful bridesmaids to inspire you. 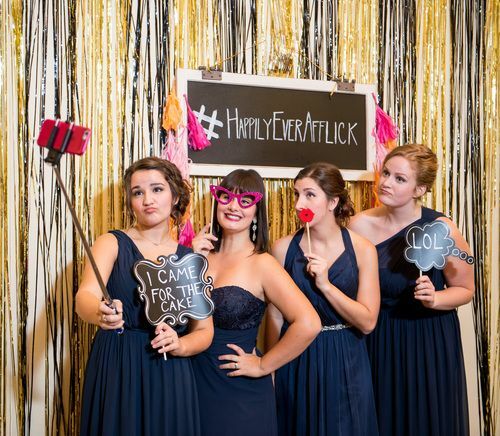 With photo booths becoming more and more popular at the wedding party, brides know the importance of funny props. This part will give you ideas of some of the more highly used props in the wedding photos with bridesmaids and help you wow your guests. For a travel theme celebration, the cool old suitcase will be a good choice. Mustaches, bridal balloon, glasses, hats, and wigs make for hilarious photo opportunities with all your bridesmaids. Another photobooths inspired is the chalkboard. Ask your bridesmaids to write funny messages on it for the photo. It will look amazing once your photographer sends the images through. This photo seems more traditional to have a photo of the bride and her girls enjoying a tipple in the bar. But, we love to see brides and their girls partaking in a little Dutch courage. A special day or night out with the bridesmaids is a great opportunity to capture fun side of the party. Uncorking the champagne is also a great photo-opp. This photo brings a whole new meaning to the term "group shot"! Capturing the group drink up is a can't miss wedding album must-have. Another creative and popular wedding photo idea is hiding behind the bridal bouquets. There are much attentions and thoughts the focus on bridal dresses, but they’re often overshadowed by those who wear them. 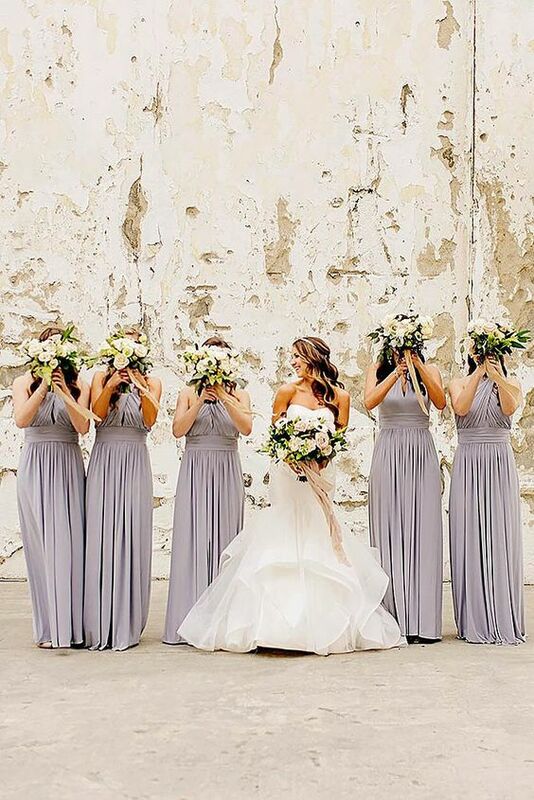 It is a fun way to cover face with beautiful bridal bouquets. It will make sure the gowns get the attention they deserve. Fun shots of the bride and bridesmaids jumping up and down on the bed capture all of the fun moments that the group represents. 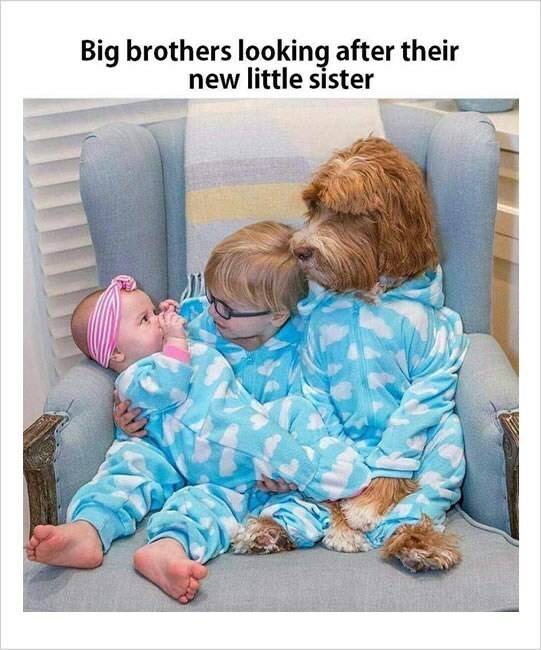 This is a cute photo. This is an opportunity that bridesmaids of all age cat get involved in. 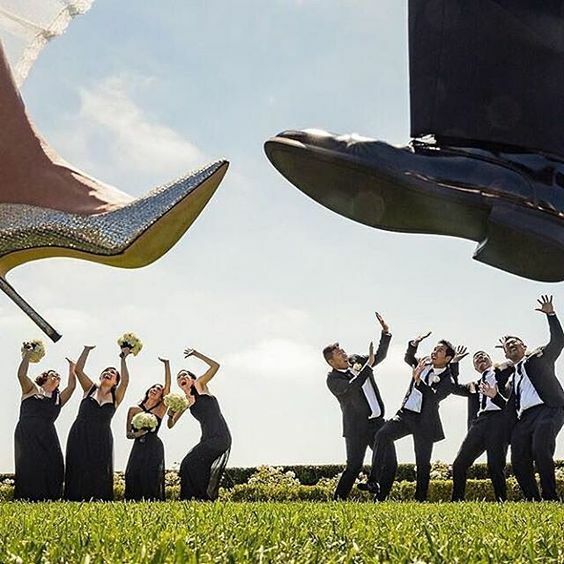 The picture with the entire wedding party needs to be a little more creative. You should remember to stick to the air kisses, or you’re likely to end up with lipstick smudges all over your cheeks before the wedding ceremony. Just feel free to take advantage of all your wedding magazines. Look at the pictures and imagine your wedding party photos in those poses to decide the basic feel for you want. Your photos can be creative as you want. You can also share your favorite photos with your photographer. Travel is an important part of modern life today but it comes to buying holiday gifts, buying something travel-related is usually not the first thing that comes to mind. With more and more travel-friendly products emerged on the market recent years, however, there has been a better time to shop for travel gifts that will help your friends and family when they are far away from home. You can get a lot of hiking moles out of this hiking carrier with your baby riding on your back. 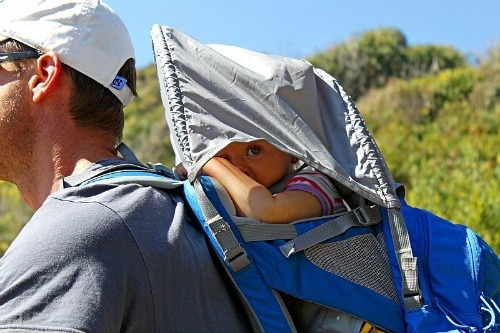 This hiking carrier is wonderful for new mom and dad. It fit comfortably and your baby will always secure with a 5-point harness system and is easy to get your child in and out of. This kind of baby hiking carrier comes with a sun hood. The user’s experience from Savannah. Travel toiletry bag is another must-have travel item for us. This gift may not be as fun as other gifts while they are a great help for any travelers. You can buy a travel toiletry bag with a hook so you can hang it up in your hotel bathroom. This is functional with separated compartments with enough space for different items. 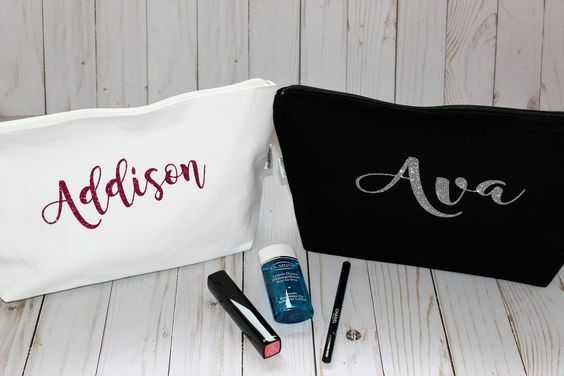 This kinds of travel toiletry bags also can be personalized with your name, initials or logo, which makes them one of the unique gifts for travelers. The night sky star map could create star maps for particular dates and locations. 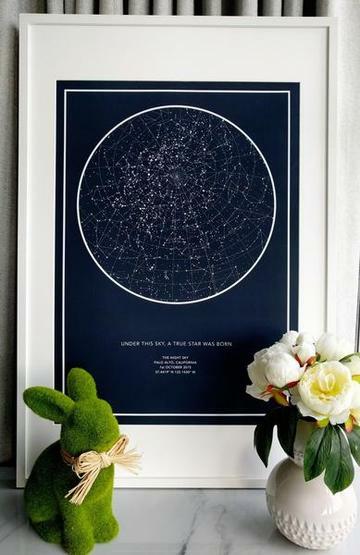 Give a gift of the stars to always remember that special date or special location. Was it your first trip? Was it the special date that you met some special people? Create an extra map for the night you met, your first trip together or any other moment that changed your life. An amazingly meaningful gift that looks great and is always a unique gift for everyone. The maker has created a simple interface for you to create your own star map. It can work on desktop and mobile. Design your star maps the way you want and personalize your map with a message that is special to you. Traveling is a common activity by men. There is a huge range of travel gifts that you can choose. If you want to get your dad or your husband maybe your brother some travel gifts, you want to make sure that they will actually like it. Travel gifts should not just be cheap. 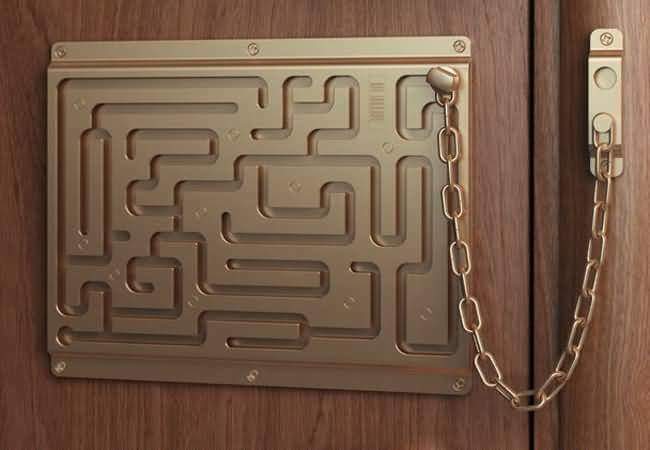 It should also be practical and creative. Easter, the springtime festival is an ideal time to welcome all kinds of flowers. It’s a time for colored eggs. It’s a popular tradition to exchange gifts on Easter. But Easter gifts aren’t just colored eggs. Whenever Easter rolls around, it seems to revolve around the kids, right? Are you still think that it seems ridiculous to get Easter gifts for adults? Why shouldn't grown-ups be able to enjoy receiving Easter gifts too? If you're looking for some unique Easter gift ideas for adults, then you're in luck. 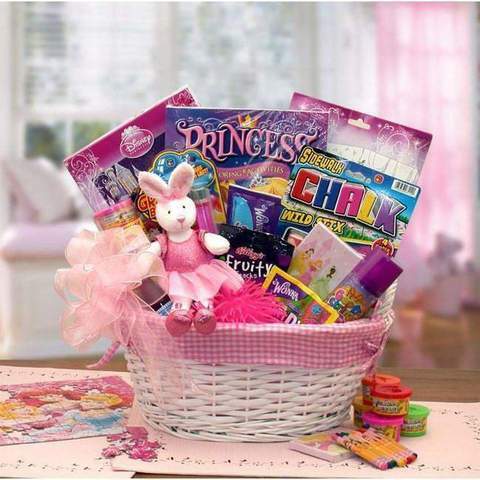 Here you will find lots of tips for finding Easter gifts for kids as well as adults. Personalized Easter gifts are becoming something of a phenomenon. These are pressies you can have tailor-made for someone special, whether it's your partner, mum, dad, grandma, grandpa... well, just about everyone on your list. Who said you have to say "Happy Easter" with chocolate? 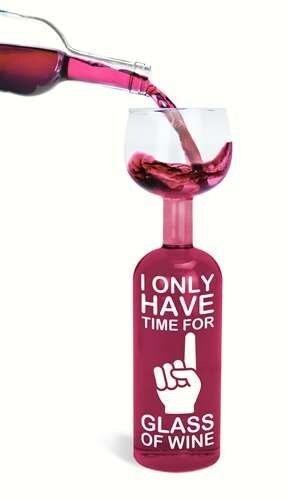 For those who enjoy wine, say it with wine glass instead. These gifts are perfect for treating someone in luxurious style. Presented in a gorgeous silk-lined gift box, you can get packs containing a bottle of their favorite tipple along with engraved wine glasses and a red velvet rose. And the best bit? 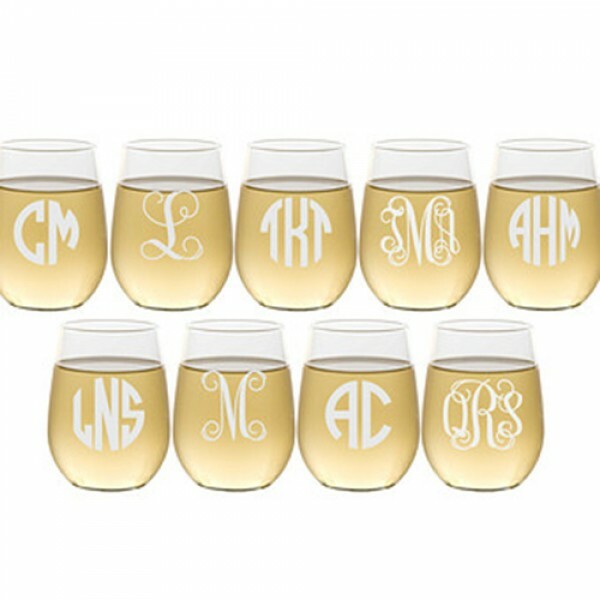 You can personalize the wine glass with any name together with a thoughtful message. Easter ideas like these are, let's face it, ideal for folks with a taste for the finer things in life. When it comes to Easter, besides loving all things chocolatey, it can't be denied that most of us have a bit of a soft spot for all things cute and cuddly. For those who are fond of fluffy-wuffy cuddly toys, there is such a thing as 'personalized Easter message bunnies'. But they wouldn't be message bunnies if, well, you couldn't add a message to them. These bundles of cuteness wear knitted jumpers, which you can personalize with any message. You'll see your message embroidered in a thread color of your choice. These adorable rabbit cuddly toys make gorgeous alternative Easter gifts and will last longer than a chocolate egg! 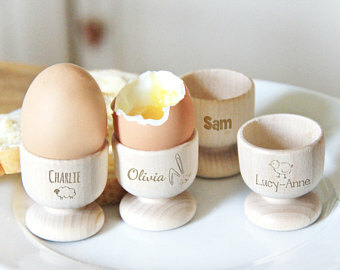 When serving breakfast on Easter morning, why not serve up boiled eggs in a personalized egg cup? It's a great way to give a gift that's Easter-related. The egg cup can be engraved with your message on it. 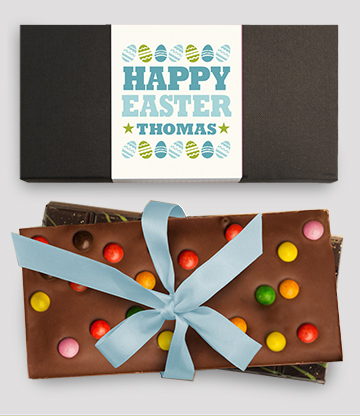 If you really have to do the whole Easter chocolate thing, personalized chocolate bars make a great choice. These are one of a kind chocolate bars featuring their name plus a thoughtful message on the stylish wrapping - the perfect Easter treat for even the most discerning chocoholic! This will be a great Easter gift for your loved one. 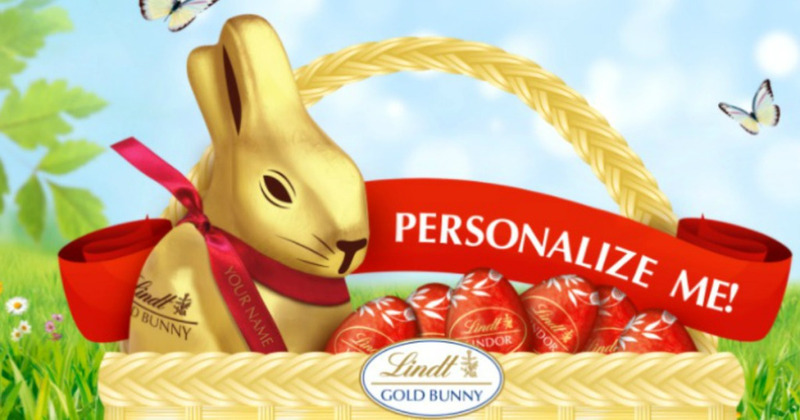 As well as a deluge of deliciously sweet, chocolatey Easter gifts, personalizedcart has numerous personalized Easter gifts of the non-chocolate variety, including fine bone china eggs cups, flowers, cuddly rabbit toys, personalized wine glasses, personalized jewelry, personalized Easter toys and more. Choose a unique personalized Easter gift for your family or friends! If finding the right gift for that special one often leads to anxiety, take a deep breath and read this article, I am sure you will find the right and unique gift for him or her. It’s almost guaranteed no two will be exactly the same. 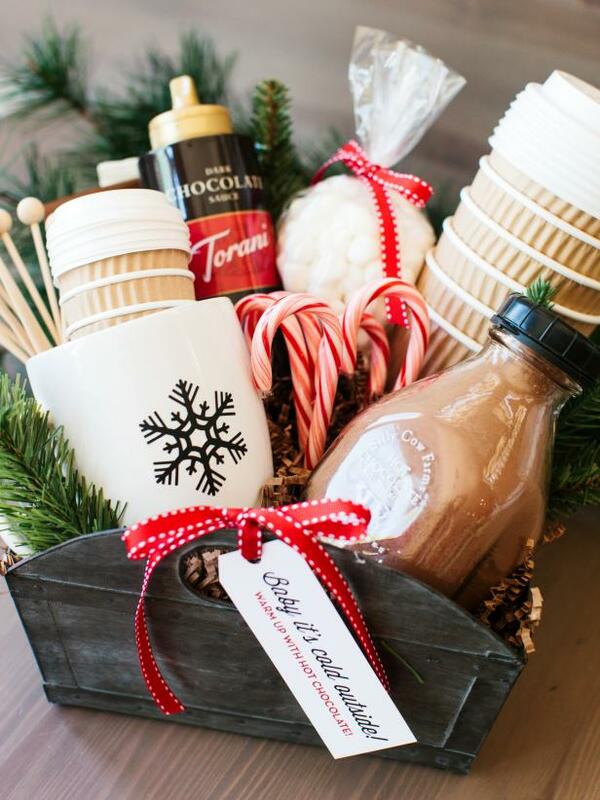 Today, I thought I’d share a roundup of some DIY gifts ideas that would make great gifts. The holiday season is coming and instead of spending a lot of money on gift-giving, why not try to make a DIY gift for the special one in our life. Here are several gifts you can make for your friends or family. It is hard to go wrong with getting your special one a unique gift that make by yourself. These DIY gifts for them they’ll appreciate. 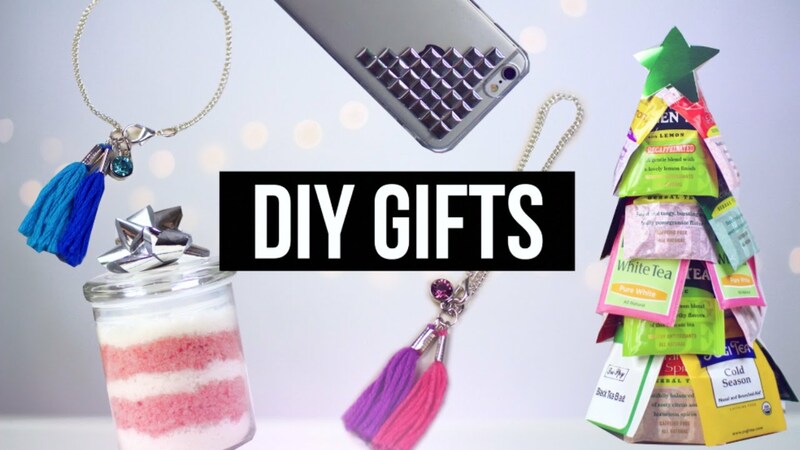 Check out these video of the unique DIY gifts for your special people in your life. These are great gifts for your boyfriend or girlfriend on valentine’s day. When your Valentine is feeling sad or lonely or just need something to remind him or her of you when you’re not together. Therefore, colorful envelopes will be the best gifts for the special people in your life. All you have to do is get some colorful envelopes, glitter makers and then write your loving words. You can also add some cute or funny pictures of yourself or both of you two when you’re together having those special moments. This handbag takes just 15 minutes to make, uses just 1 sheet of paper and is the perfect gift wrapping and packing for the gift. You can design it to match the recipients' tastes and styles. You can also image their delight when you present the gift in the beautiful and unique gift bags! This gift bag is simple, quick, easy and cheap to make! Are you ready to get started? Just check the tutorial video to make it. In this video, I’d like to share a happy birthday gift- ring and handmade card with you. You can use a light turquoise color cardstock to create the card blank and die cut the top panel using a scalloped rectangle nesting die. These perfect stamp set will offer a wonderful choice of sentiments. You can choose this one that writes “Have a wonderful day ever! ” You could create the butterfly Embellishments and you could also melt “melt it!”. Then the card has been finished by adding butterflies using glue dots. I hope these DIY gifts make your holiday season just that much better. Which of these gifts is going to be on your to-do list this year? Let me know which one is your favorite, and have a nice day. Hope you enjoyed and get inspired! Be sure to check out my other gifts posts. If you need a good laugh or a smile, this blog will make you laugh out for days. I hope you like these pictures and have a nice day! 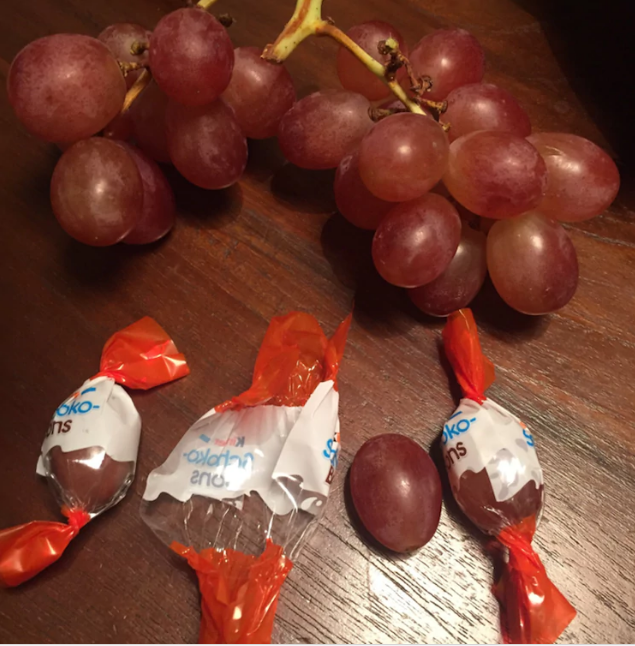 1.How to Lose Your Kids’ Trust in Three Easy Steps. You will always get laugh at this type of treachery and deceit. "WiFi" has become the synonym of "wireless" in some informal contexts!! 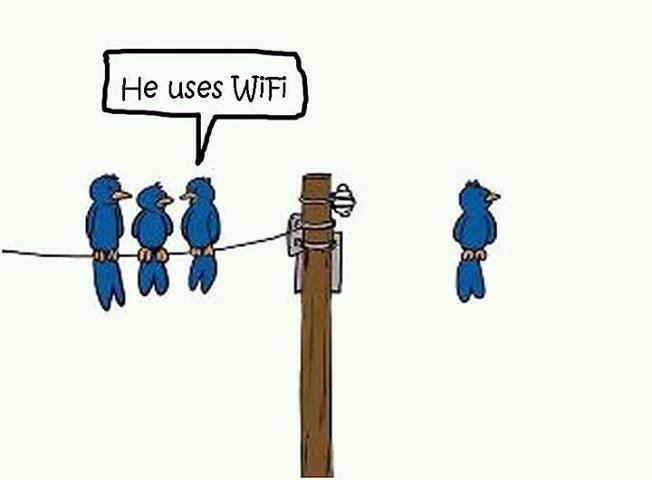 Birds are starting to use wireless technology!! 5.You've Been Poisoned Coffee Mug. You'll find nothing more disheartening than downing a tasty drink quickly only to find that you've been poisoned. Scare the hell out of your guests with these terrifying “You Have Just Been Poisoned” mugs. 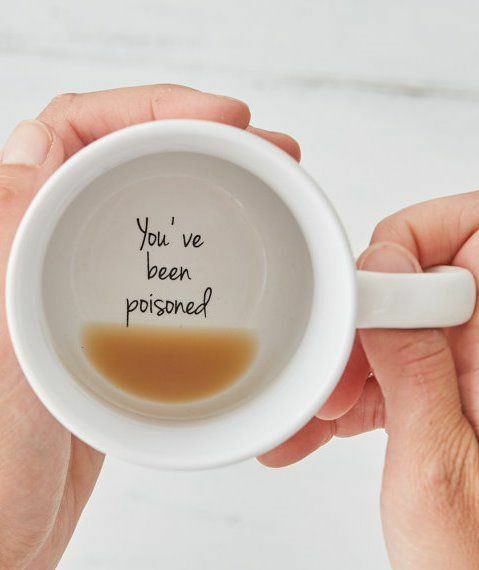 Perfect for serving drinks to people you secretly hate, or for just playing pranks on friends, the “You Have Just Been Poisoned” mug have a variety of evil applications.It's sad really. At least with this era, we generally don't need to worry about being poisoned. Generally. And we can joke about it. What's that? You want more pictures?! 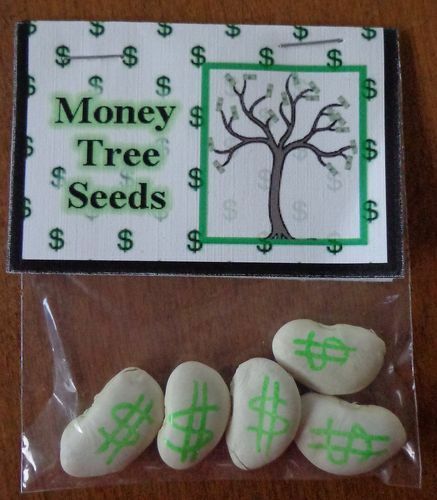 Plant these seeds and you will reap lots of money!!! You can make these DIY gifts for your father on Father’s day. I am sure he will love it very much! You need to find things to make you laugh and smile every day! I suppose there are lots of different kinds of things that make you laugh: something stupid, something silly or jokes, and sometimes just ridiculous things that happened in everyday life. Do you like making other people laugh? Why or why not? The Valentine’s day is almost around the corner, and it’s a unique day for many people. 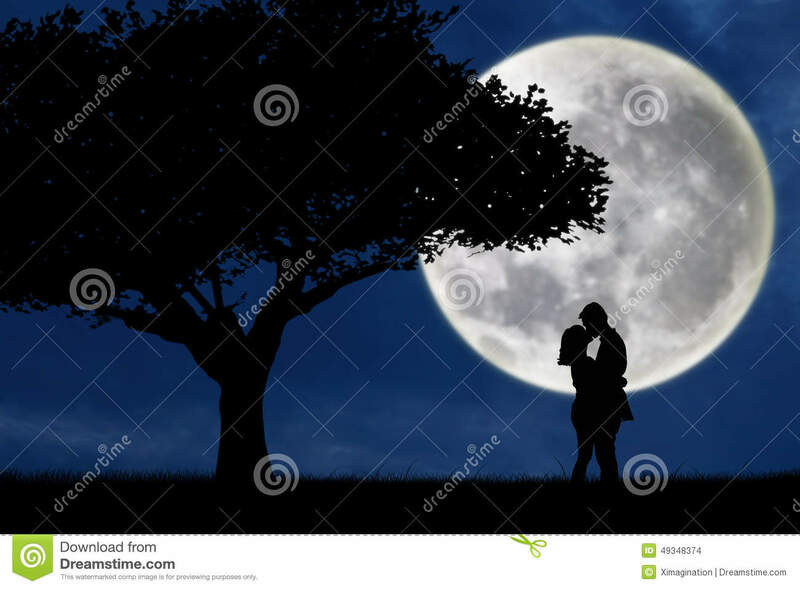 Most of young girls and boys may take a romantic date or go out with his or her boyfriend or girlfriend. But there are lots of people who are not taking a date or have a boyfriend or girlfriend. They should have different ways to spend the special day. For example, single girls can arrange a sleepover party while a bachelor party will be an excellent idea for guys. But whatever you decide to plan on Valentine’s day.There will probably be most of you who don’t know what to wear on that day. In order to help these guys, we made a decision to write a Valentine’s Day outfit guidebook, where you can obtain inspiration and suggestion on what you might wear on that special day. One of the most romantic ways to enjoy your Valentine’s day is to get dressed up for the special occasion. Valentine’s day is coming, but don’t worry. 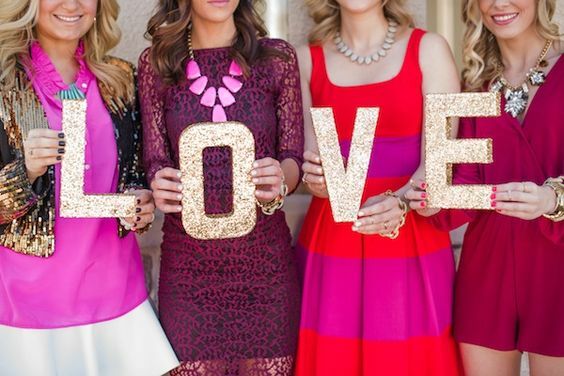 This guidebook has covered on all your Valentine’s day outfit. This guidebook will be divided into three parts: 1. outfit for dating for boyfriends, 2. Sisters installed outfits, 3. Outfit for the bachelor party. Hopefully, this Valentine’s Day outfit guidebook is useful, and we wish everyone to have wonderful and great Valentine’s day filled with love and happiness. We picked out these dresses that you can wear for your date with your boyfriend. They're very romantic. The comfortable is an important factor for the outfit that you wear and that you simply feel confident in. 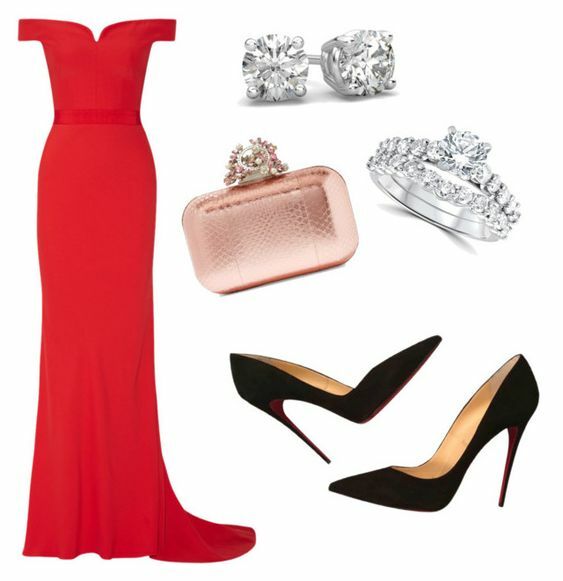 We believe that colors like Red or Black are fantastic colors to choose for Valentine’s day. Red is associated with romance while black is associated with something mysterious. Your outfit should be a reflection of your personal style. For accessories, you are able to for instance wear earrings and necklaces with pearls or diamond details. Just dress to impress, make it simple without lots of details and let your personality shine through. We picked out these sister installed outfits. For those girls who don’t have a boyfriend, not found a romantic date and all of her friends have other plans. If you're lucky to have a sister, who doesn’t have plans on this special day. It is a good idea to make plans together! For example, go shopping together, making cupcakes, go swimming together or go to a party. It will be very enjoyable if you wore matching dresses in different colors. We picked out these outfits to wear for a bachelor party. If you are happily single and want to enjoy a fun day with friends, let your outfit reflect your good spirits. It’s supposed to be a fun occasion, and a great chance to dress up a little. At this party, you will find single men and women.This is an excellent chance for you who are still single. So you've got to dress. Make yourself look more appealing. An excellent suit would go well. How about these outfits? Do you like them? My house is overflowing with a lot of toys that appear to never get have fun with or are missing pieces. As birthdays and holidays come around every year, the toy box keeps growing, sometimes away from our control. With my son’s birthday in July, this makes me think about gift ideas for him that's more practical, which have a longer lifetime, or that offer a day of creating memories together! I’ve compiled a summary of 10 fun, non-toy gifts that will be guaranteed to be considered a hit for your child’s next birthday party or holiday! Keep this list handy, and share it with your loved ones and friends. Books are excellent gifts for kids of all ages! You will find endless options in the store or you can purchase personalized books online that include the child’s name, initials and your loving words. You could possibly even buy books that record your voice reading your child an article. How fun! I really like buying a book and attaching a gift card towards the bookstore with ribbon along with a special note! 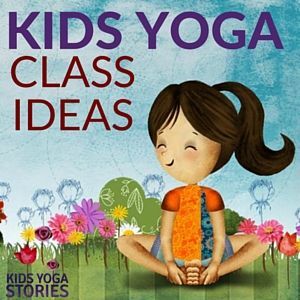 Have your kids been asking to take a yoga class or even register for golf lessons? Maybe they would like to learn how to play the guitar or are in need of swim lessons? The present of classes is a fantastic idea as well as a fantastic way to encourage your kids to master a totally new skill! 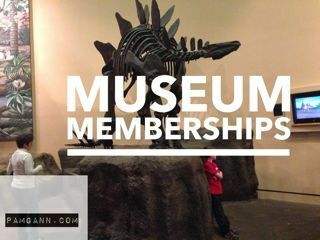 Probably the greatest gifts we've received can be a membership to a local museum for your kids. We could have plenty of family fun days while my son has a blast studying the museum. Memberships to local zoos or museums are a very good gift that this entire family actually gets to enjoy for the whole year! Whether it’s a weekend at grandma’s house or perhaps a long vacation, children love having their unique special toiletry bag for his or her adventures! A good leather toiletry, personalized toiletry tags, a small toiletry bag, or perhaps a new backpack along with a favorite character are all practical gifts that kids are able to use for many years. 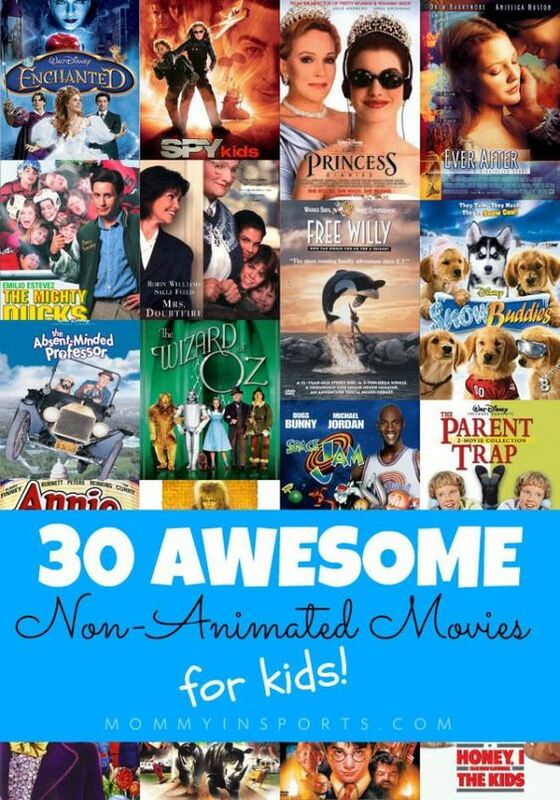 DVDs are actually excellent gifts for the entire family to enjoy in your house on the couch or during long trips. You can create this gift a lot more fun by bundling it together with the child’s favorite movie theater candy and popcorn. 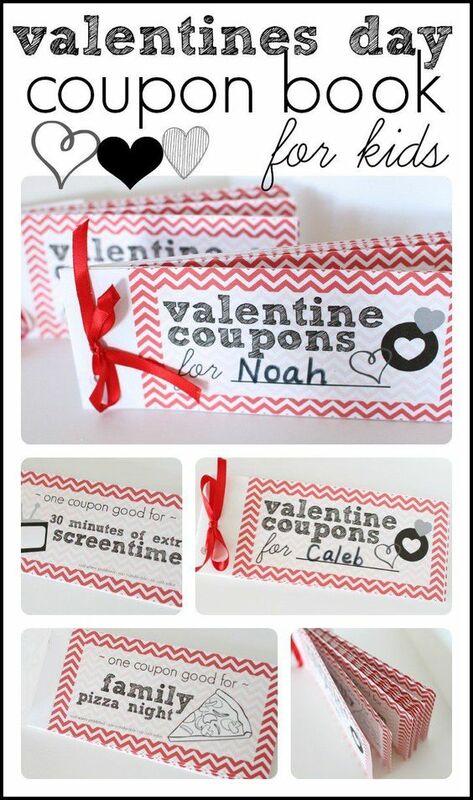 You might also attach a movie theater gift card along with a fun ribbon as well as a special note. With an all new school year coming soon, personalized name labels create a great gift for children of all ages. 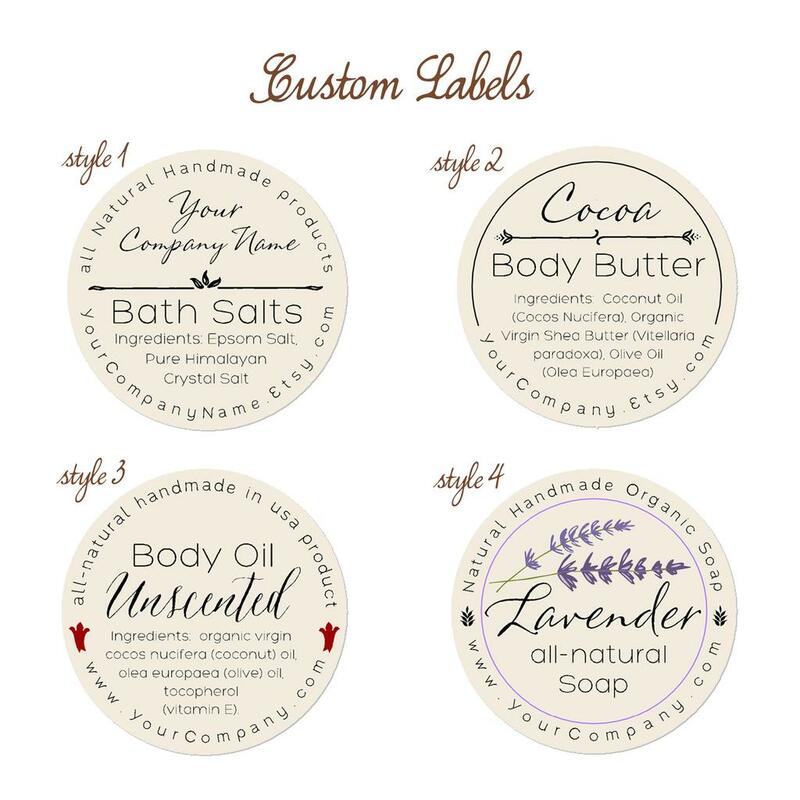 Personalized name labels may be used on school supplies, within shoes and coats, on water bottles as well as on toys. Name labels help keep track of personal belongings. Plus, labels are great and great to obtain for daycare up through senior high school. It is a fun idea for kids who like to bake at your home. 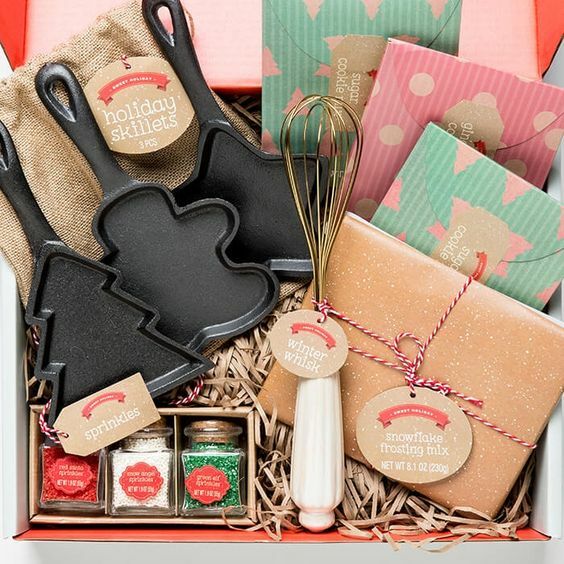 This gift box could include your entire baking needs like cupcake liners, a child-size apron, colorful spatulas and mixing bowls, measuring cups and spoons, recipe cards, and plenty of sprinkles! 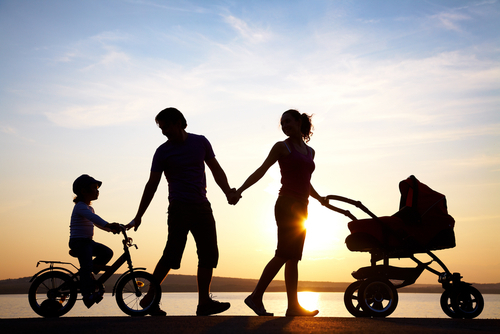 Children experience frequent growth spurts, and every parent wants to store happy memories for their children. So, it is a good idea to buy a personalized picture frame to put pictures of the children. This gift could possibly be anything from an active kid-friendly show to putt-putt, a nearby public pool, or laser tag! Activity gift cards are sure to bring a fun-filled day's memories for your kiddo! Eating out could be expensive, and frequently the adults are able to decide best places to eat! Provide your child the chance to choose their favorite restaurant and utilize a coupon that’s only for them. I hope you have discovered this list helpful and think about it once your child’s next birthday or holiday comes around. I have got innumerable holiday memories. A lot of them focus on faith, family, and traditions. Only a few childhood memories actually contain the gifts I received. I clearly remember the year that I received a cool and unique bike, that evening my sister and I received a Nintendo, and opening socks each year from my grandma and grandpa. Besides that, my gift-receiving memories are pretty sparse. 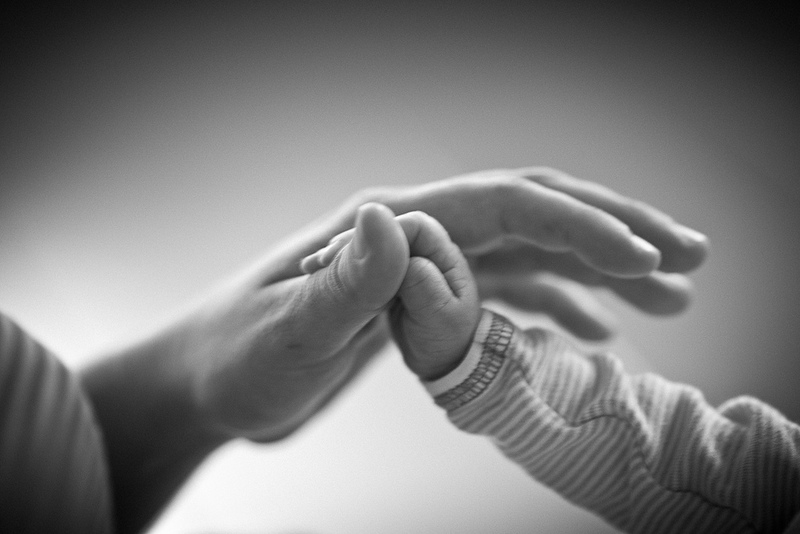 Which remind me thinking… what sorts of gifts will we give to our kids that they will keep in mind forever? What gifts will absolutely impact their lives and change them forever? 1.Affirmation. It is true that sometimes a simple word of affirmation will change a child’s life. To ensure that your children recognize how much you appreciate them. And after that, remind them every opportunity you get. 2.Independence. You should teach your children how to think independently and how to live a good life independently. And you should teach your children how to take care of themselves both on material and spiritual. 3.Patience. Those kids with good patience and good tolerance will get more opportunities. 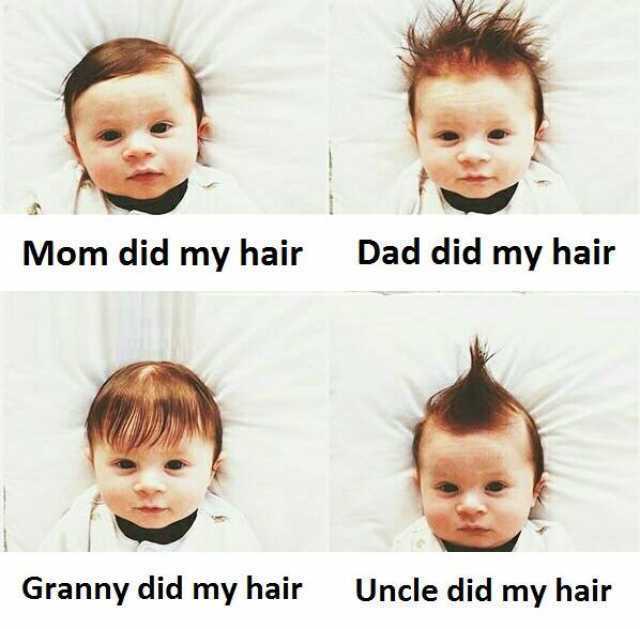 Parents should set an example for their children. You can also help your child to develop their patience by talking with them. Patience is also an important gift that parents give them. 4. Challenge. You should encourage your kids to dream big dreams. Therefore, they will likely accomplish more than they thought possible… and even more than you thought possible. 5.Responsibility. In order to cultivate the sense of responsibility you should teach your children to do something that within his or her power. Responsibility is one of the best gifts in your children’s future work. 6. Compassion/Justice. It is said that life isn’t always fair. It never will be - there are too many variables. However, if a wrong has actually been committed or a field be leveled, I wish my child to become active to help to level it. 7. Contentment. The require for more is contagious. 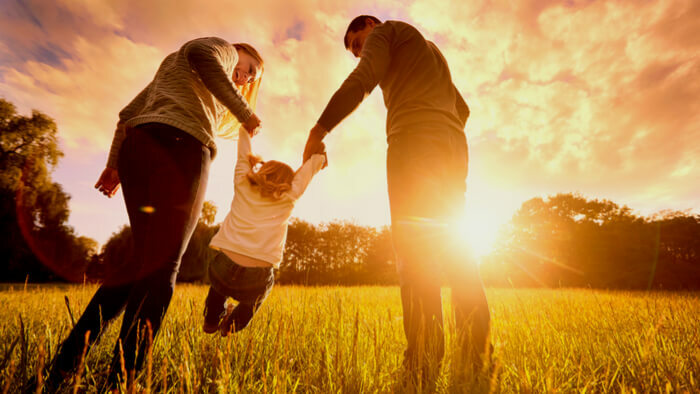 Therefore, one of the best gifts you are able to provide your children is definitely an appreciation for being pleased with what they've got, who they really are, and who they will become. 8. Self-confidence. They will gradually become assertive and knows what you want through study independently.A confident person usually does not need the affirmation of others, there is a sufficient reason for what they do. 9. Curiosity. You should your kids to inquire about who, what, where, how, why, and why not. The words like “Stop asking a lot of questions” should never leave a parents’ 10. Determination. The size of their will is one of the most useful determining factors in one’s success. How will you help build your child’s today? 11. Discipline. Children should try to learn everything from the ground-up including appropriate behaviors, the way to get coupled with others, the way to get results, and the way to achieve their dreams. Discipline should be consistent and positive rather than avoided or withheld. 12. Encouragement. Words are the most powerful weapons in the world. They could create or they will destroy. Simple words that you simply choose to speak today can provide encouragement and positive thoughts to the child. Or maybe your words can send them further into despair. So it is very important to choose them carefully. Of course, none of these gifts are on sale at our online store. But, I think these are the best gifts for your children. Hi friends, what do you want to buy for your boyfriend or girlfriend this valentine’s day? Give your loved ones the gift that was made by yourself. A DIY gift is a thoughtful idea that will be cherished by your loved one for many years. Valentine’s day is the perfect opportunity to let your loved one know how much you love him or her. If you are still unsure what to buy, know that you can never go wrong with handmade gifts. Do they like rose and foods? 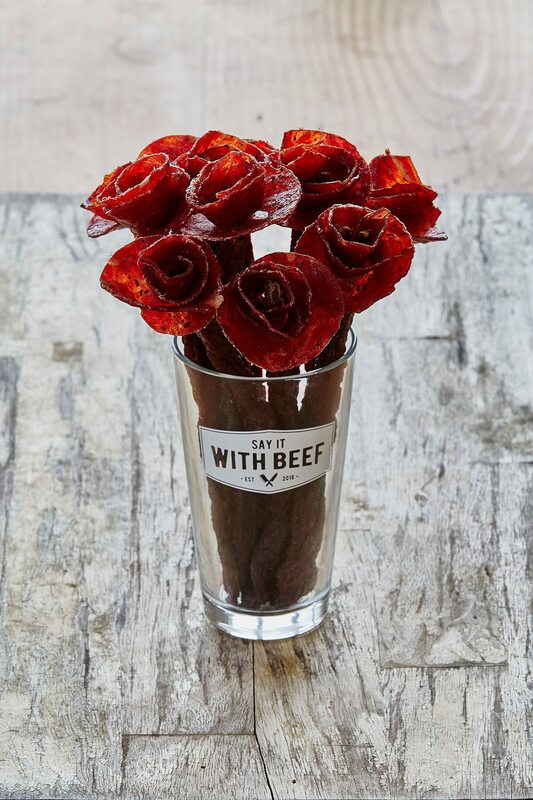 If they like both rose and foods you can surprise your girlfriend with beef jerky flowers. Yes, you hear that right! How does the picture look? Delicious or romantic? So, if you were looking for a unique and awesome gift for your girlfriend this Valentine’s day--look no further. Beef jerky flowers will be the best gift for these girls who love romantic and meat. When they receive the special flowers they can put them in the beer glass or a vase. There is no wrong way to display these tasty treats. Clothespins are always used for hanging laundry out to dry but nowadays there are more uses for them. 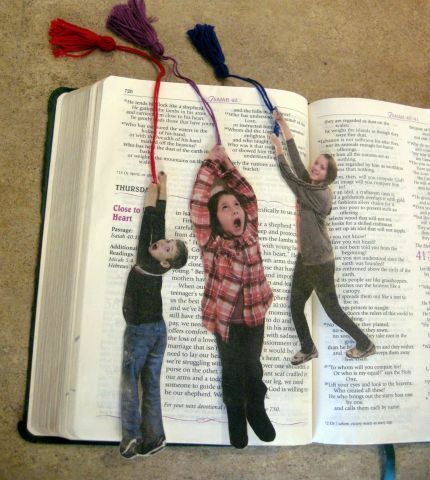 They can be used to create adorable crafts and they can be used in other ways. For example, you can use it to show your love to your loved one on valentine’s day. 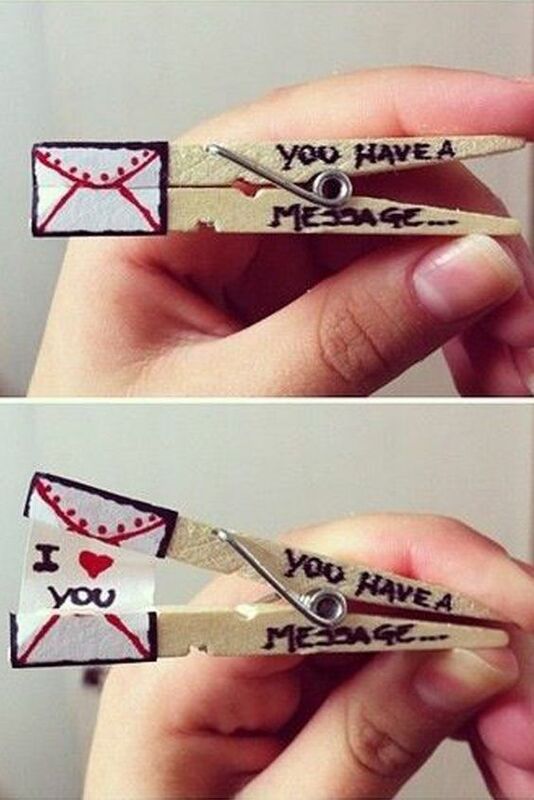 Here, I will share a unique idea clothespin idea with you. Just look at the picture carefully, then you will find it is easy to make a unique gift like this. Memory boxes are the best way to collect all these little tokens, pictures and treasures you want to keep to remember your loved one. You can spend several hours or even several days just browsing memory box online and buy them for your loved one. 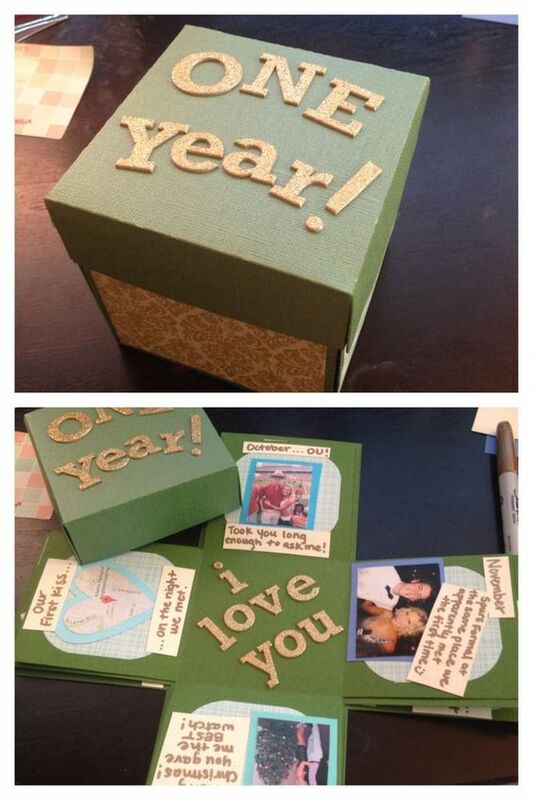 I think it is better to create your own memory box to your dearly beloved, especially on Valentine’s day. Celebrate this Valentine’s day with photos in this sweetly arranged photo memory box. You need a small keepsake box, small print of your favorite photos and cardstock. The Valentine’s day is just around the corner. You should be prepared for some creative gift wrapping ideas to make the outside of your gifts as unique as the inside. Look at the picture. It is so easy to make CD like this and it looks fancy. 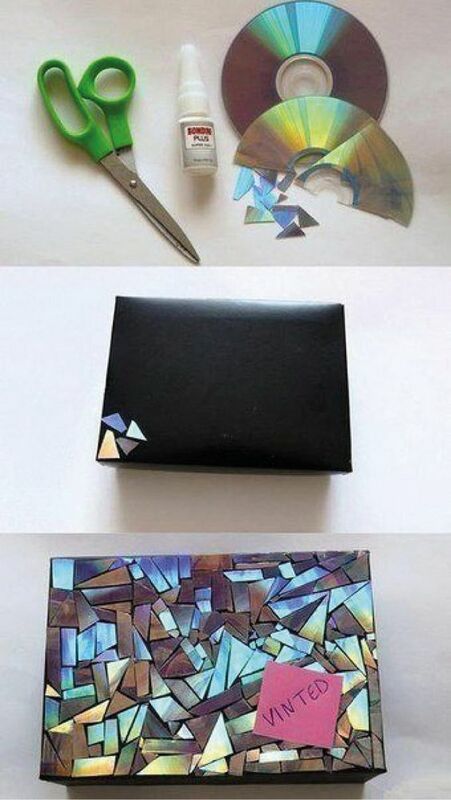 Use old CD to create cool and awesome gift wrapping that will give a magical and fantasy look to your loved one. 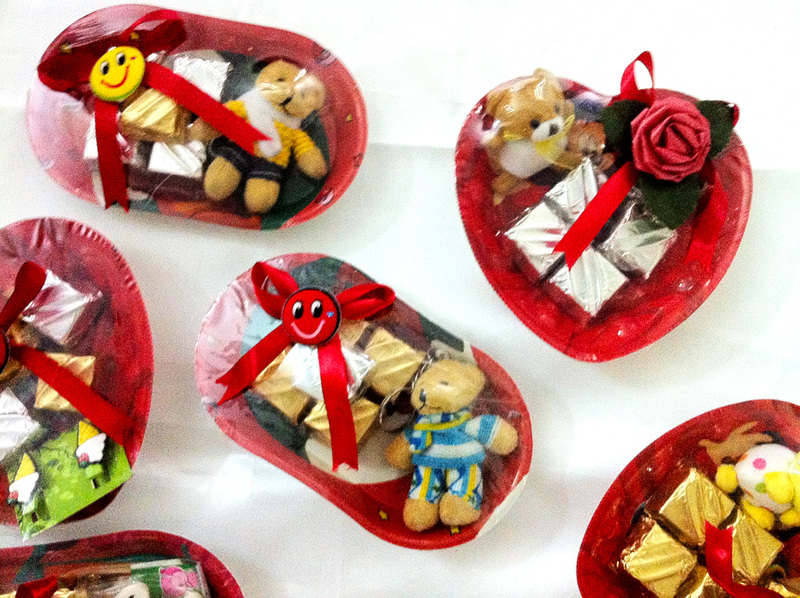 There is no better way to show your love and appreciation to your loved one with these handmade gifts. Each and every one of these gifts is as unique and individual as you want them to be with your own creation. I am sure they will love these meaningful and unique gifts. By following a few simple party planning tips, you can make your next big event go a little smoother. Imagine what it would feel like to have most of the planning done ahead of time so that you could truly relax while hosting the special day. In this article, you will read a few helpful hints for helping your plans turn out successfully. Christmas is on the way, and I‘m sure you’ve get a long list for it. I guess the list must include the person you need to send gift for and the gifts you’ll prepare for each single one. Sometimes, your dish ingredient are also involved. Christmas stuffs vary in all categories and in different people and family, but there’re 5 stuffs that are necessary for all people. Christmas tree is the most important thing for the Christmas decoration, and also a distinguished symbol for the memorable event. It’s the most enjoying and happiest moment when all family get together, decorate Christmas tree, and sit around it to chat. 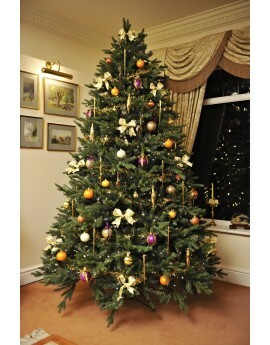 As for the Christmas tree, there’re much more choices for you both online or at offline stores. Some tend to artificial one, while others may turn to a real one, like potted or wall mounted. The real one may give more emotional feelings, but it doesn’t mean the artificial one is not good. They have their own advantages, and the decision by you would be determined by your own fondness. Just make sure that it’s strong enough to hold the ornaments, and can always keep the standing posture at right place in the whole holiday. Christmas stockings are most common stuffs for the holiday, and without it hanging on the fireplace, everyone would feel something weird. As you can check in different sites and other channels, they vary in different materials, but the general designs look alike. Kids are in obsessed in finding the hidden things inside stocking, while adults enjoy more about the happiness of reunion. 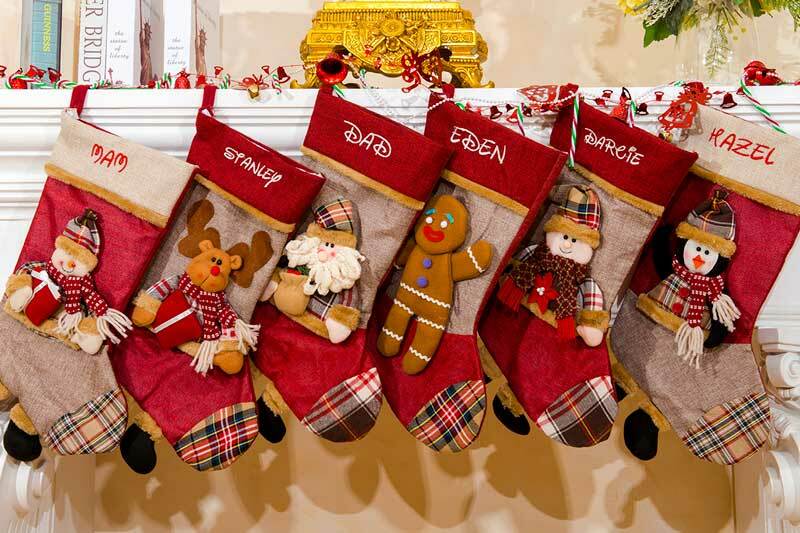 In our site, we choose several perfect designs, and embroider each stocking with an exact name. Font and quantity are all optional. The important thing is that they’re CHEAP, all are in an affordable price, you don’t need to worry about the budget. Christmas cards are necessary because they’re the carrier of your blessing and best wishes for others in the coming new year. It maybe the only time in a year for your friends and family to get news from you. So it’s special, and it needs some attention and creative thoughts. 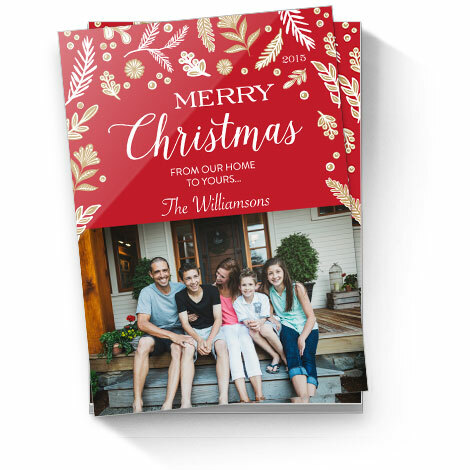 There’re various cards for you to choose, and I think if you want it different, a personalized Christmas cards would be a great choice. You can pick up a family photo and add your own blessing and information to ask someone to hand-made them for you. If they’re in a high-quality, it’s possible to be display in an album and for your friends to cherish a lifelong time. They’ll always feel happiness because this little card from you and remember this memory. 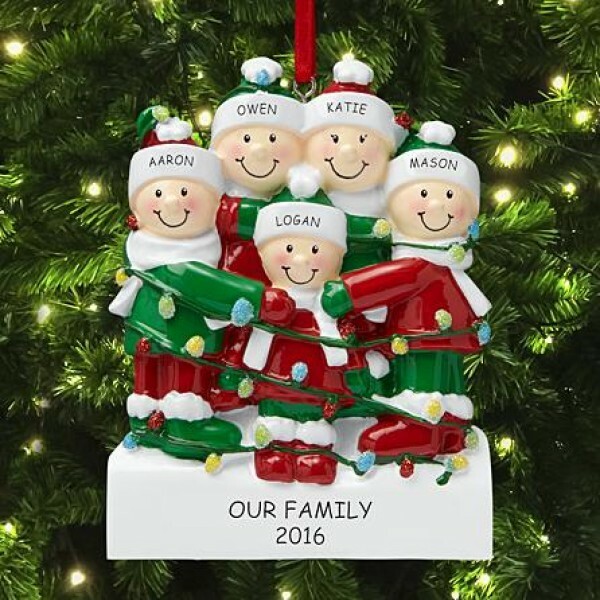 The decorations for the Christmas tree is always a big event in holiday, and it can gather all your family’s imagination and endeavor together. But if it’s always the same from year to year, it may become some kind of boring. This year, try to make some changes to it. Besides baubles, balls, gingerbread, gems those little things, I recommend you to add those engraved resin ornament, as you can see, because the engraving they bear, they’re not only a small decoration, but also a meaningful thing. The dishes with whole family always the most delicious in life, and that moment with so much happiness can be a permanent memory. Cookies are always the unforgotten part, especially for kids. They always have curiosity in everything, and be fond of create new things, so they’ll never miss the enjoyment of making cookies. 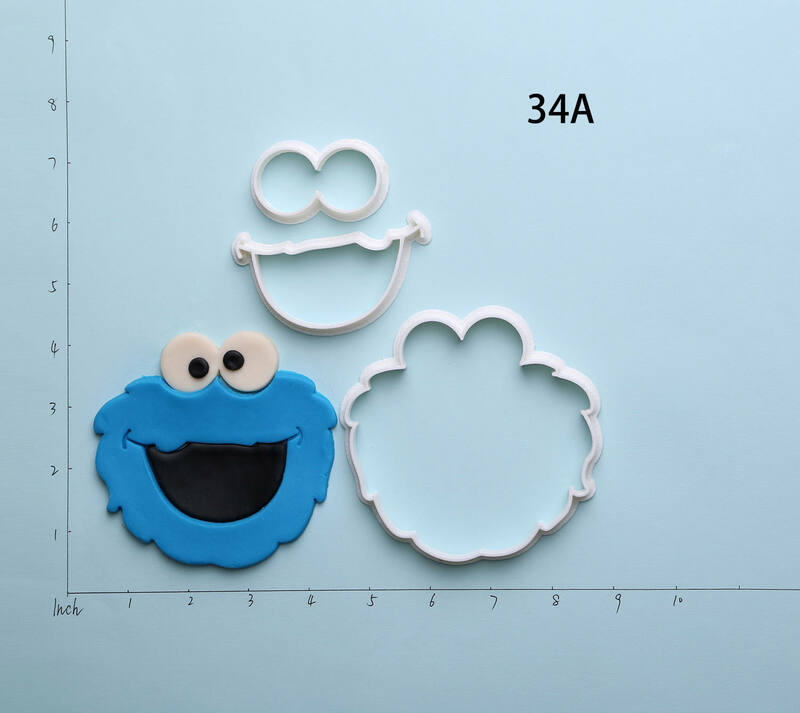 Choose some designable cutters, and have the enjoyment of making cookies with your little angels. Trust me, those little thing can bring more happiness and surprise than you can image. Christmas is the most hopeful but busiest holiday, and it’s time to start the preparation for it. Make sure that you’ve done enough for those simple stuffs. They’re necessary, and creative thoughts or movement always make great change. Hope you a happy Christmas ! Personalized gift, as its literal meaning shows, a gift with some personal element. In the cold winter, a cup of hot coffee or any other beverage can always warm us from body to heart. Our YETI mugs use the special materials to keep heat for several hours. 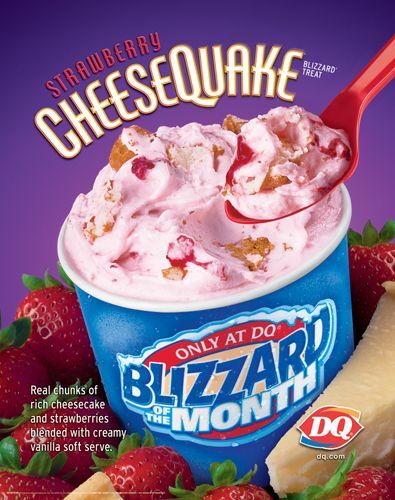 That specialty makes it a great companion for outdoor activities. The other thing need to be mentioned is that we use the laser engraving technology to engrave a name or initials on its surface, so it can’t be rubbed off or wear off with frequently use. There’re several different font and style for you to choose. 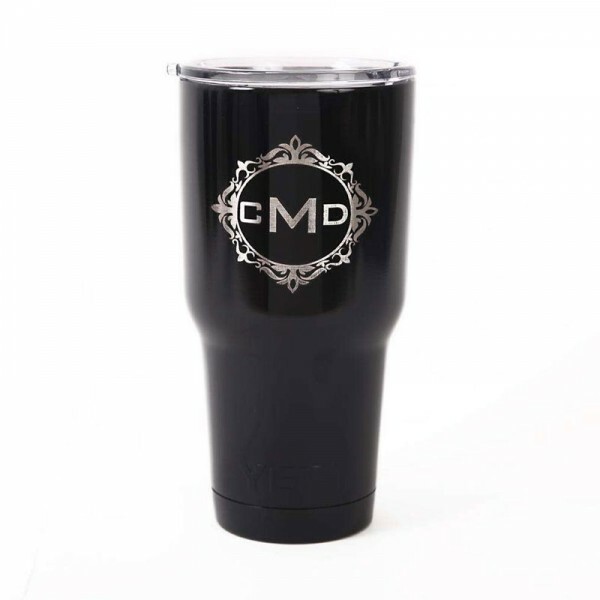 All YETI cups are in a reasonable price and engravings are TOTALLY FREE. 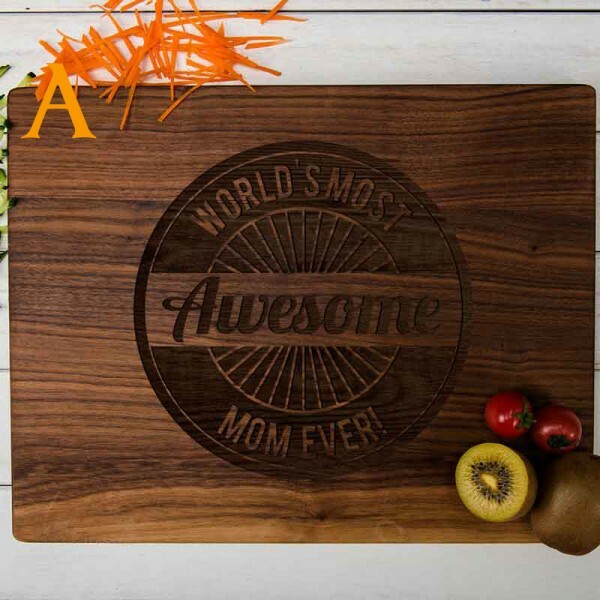 Cutting board is not only a useful tool in the kitchen, but also an exquisite decoration in the house, especially the vintage styled one with some meaningful patterns on it. We choose high-quality black walnut as materials and make it into different sizes. Our engraving technical makes it come true for a vivid pattern to show up and last forever. We accept custom orders, so you can have your own ideas for it, a rough draft, some specific ideas or thinking, anything would be OK, we can discuss it together and then I’ll show you the proof. NO EXTRA CHARGE OR REQUIREMENT, a clear statement about the time when you need it would be much appreciated. Too much mechanized goods always give people a sense of coldness and insensibility, while a handmade item always makes people feel more emotional and energy-involved. 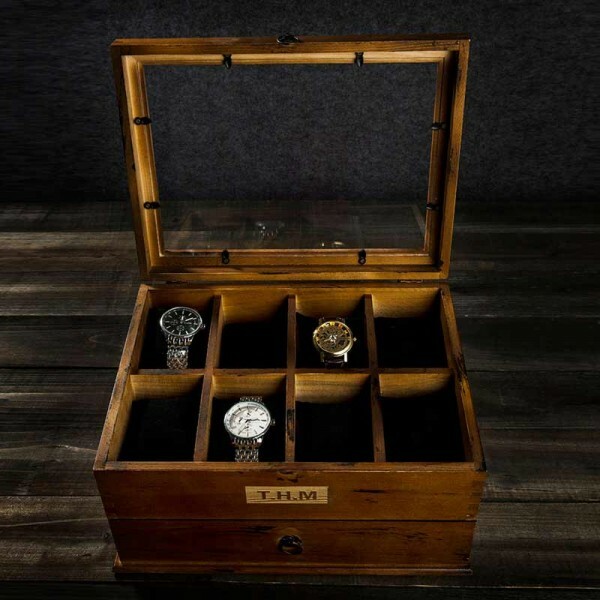 The wood watch box connects both elegance and practicability. On the one hand, it can store some life accessories, like watch and buttons. On the other hand, it can be an excellent decoration on your desk, no matter aside the bed or somewhere else. Its vintage design and style always the focus for eyes. Creative ideas are always great choices for gifting. The point lies in creative, that means try to create something new and imaginary. 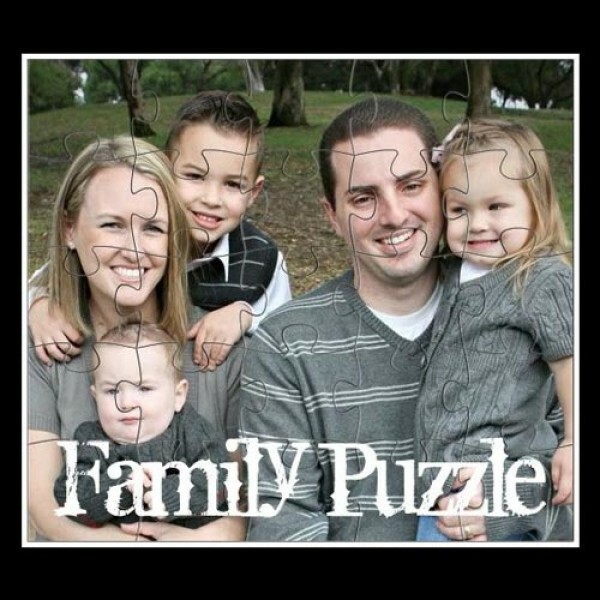 Our photo puzzle’s made from the photo or picture you may provide, and the specialty is it’s really the unique one in the world. Think about that, people may have same name and same taste in the choice of a design or font, but the photo can never repeated. When a photo is broken into pieces, every time you put them together, you’ll recall the happy moment in life. This game is suitable for any age in life, from a little kid to an elder man. Taking photos has been a common habit to record happy moments, and sometimes maybe some memorable event in life. 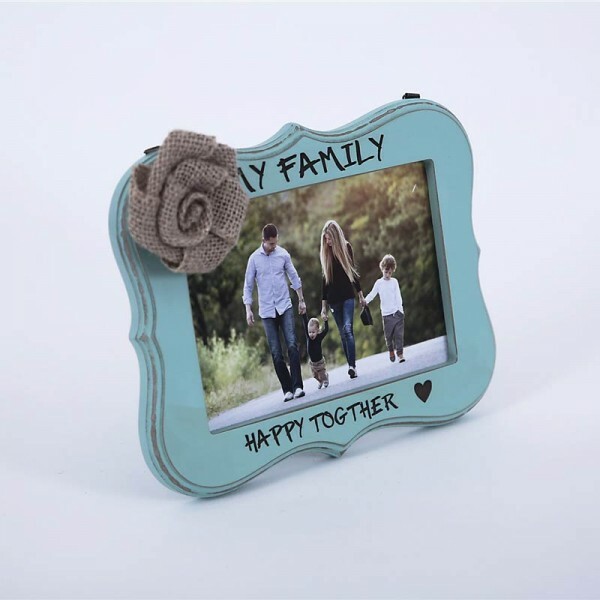 So choose a well-designed picture frame for Christmas gift can never be wrong. Only remember to add some small tips to make it special. In this aspect, we have various options for the design and personalization. You can add whether a name or a meaningful sentence. I’m sure the recipient would love it. 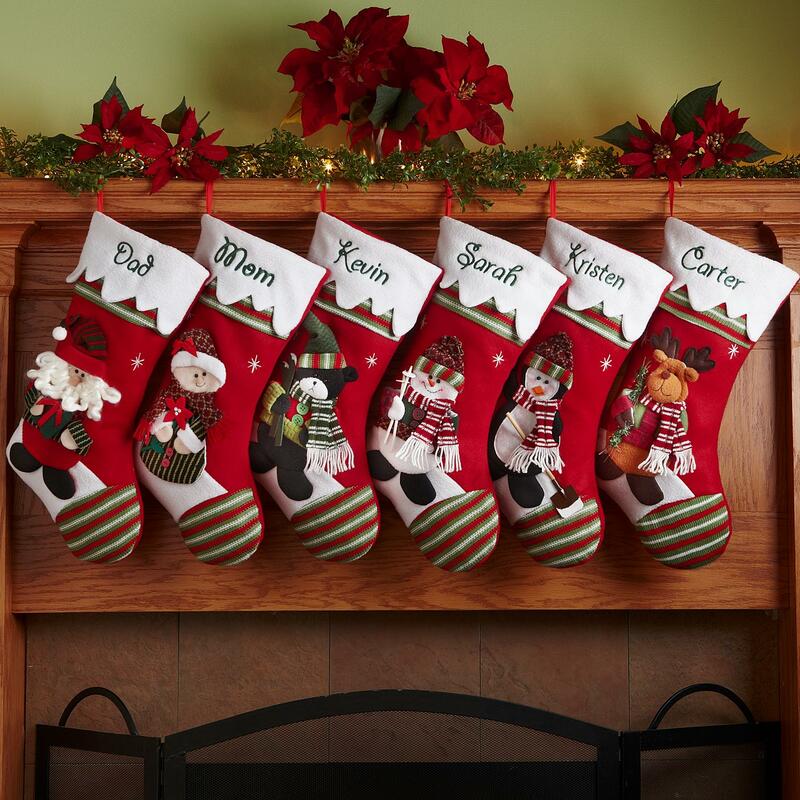 Referring to Christmas, Christmas stocking is the most common thing to appear in mind, and indeed, it’s the most common thing for the holiday. Lots of people have choose this category to start the business, and someone really did a great job. We compare different materials and sorts for designing, and finally get those stockings in our site. They use the high-quality velvet as materials, and bear some changes under the traditional designs. In each stocking, we use the technology of printing, knitting and embroidering to enable name or monograms to fit in. All the 6 gifts here are what I thought the best Christmas gifts in 2017, I recommend them because they’re real great stuffs, each of them has its advantages and specialty, and the same point is they’re inexpensive. So if you have a tight budget or have a lot of recipients to give gifts for, those options are all great sale for you. Hope you can get the one you need.